The Nisca PR-C101 card printer provides a simple and affordable entry-level card printer solution for good quality and durable ID card printing. Nisca’s PR-C101 card printer provides a simple and affordable out-of-the-box single-sided printer solution for good quality and durable plastic card printing. 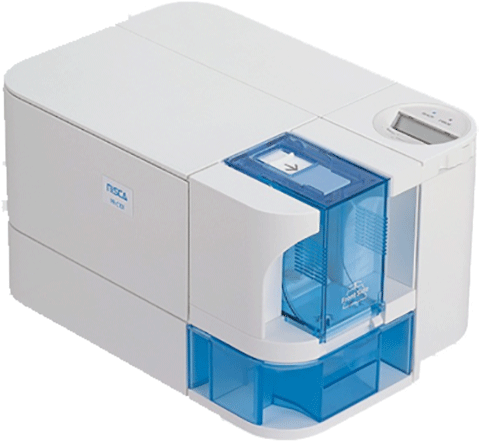 The Nisca PR-C101 card printer is small enough to fit into almost any working place and due to its all-in-one ribbon cartridge and smart cleaning roller, the Nisca card printer requires low maintenance standards. With its rotating LCD panel that provides complete, easy-to-read status messages and prompts, and an optional front or back exit, this basic printing solution is great for small organizations like libraries, clubs or institutions. The PR-C101 card printer provides you with 24-bit image quality, which allows yout to imprint a 2-point text on every plastic card. The PR-C101 has a MTBF of 20.000 plastic card prints and is therefore a reliable and cost-efficient enty-level card printer. Magnetic stripe encoding and same side card input and output are also available for Nisca PR-C101 printers. 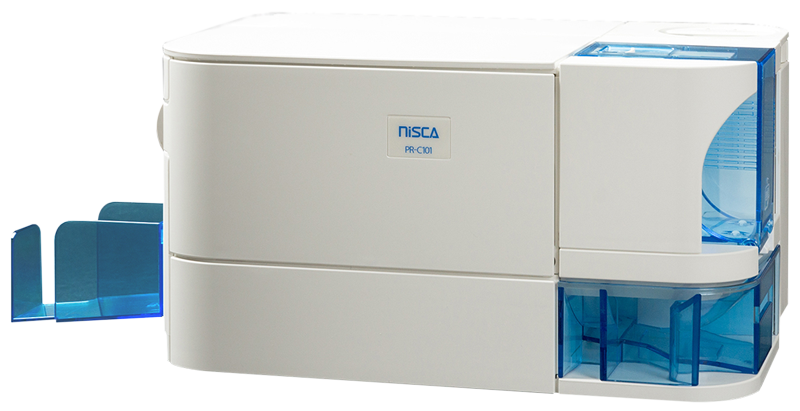 If you prefer more Nisca Card Printer quality, check out our outstanding Nisca PR-C201 card printer with 600 dpi printing solution!